The action is heating up here in Western New York. I hunted Livingston and Ontario Counties this Saturday and Sunday where I encountered some decent action – including one of my Hit List deer. Two does work past my stand. Deer movement is on the increase and this week’s cold snap shouldn’t hurt things. I hunted our Livingston County Farm on Saturday where I encountered over a dozen deer, including one decent buck that I wasn’t able to get a good look at. Sunday was warmer and sunny, but I hopped in the stand anyway for an afternoon hunt. I didn’t have high hopes, but movement was swift throughout the afternoon. I was able to grunt in one of the bucks on my Hit List, but he locked up at 30 yards, behind a blow down. With a bad angle and a tree in my way I had to watch him walk. If it hadn’t been for that tree, I’m guessing this entry would have had a different headline and topic, but hey, that’s why we hunt. It’s worth noting that I also encountered a 1.5 buck who was clearly in the seeking mode. 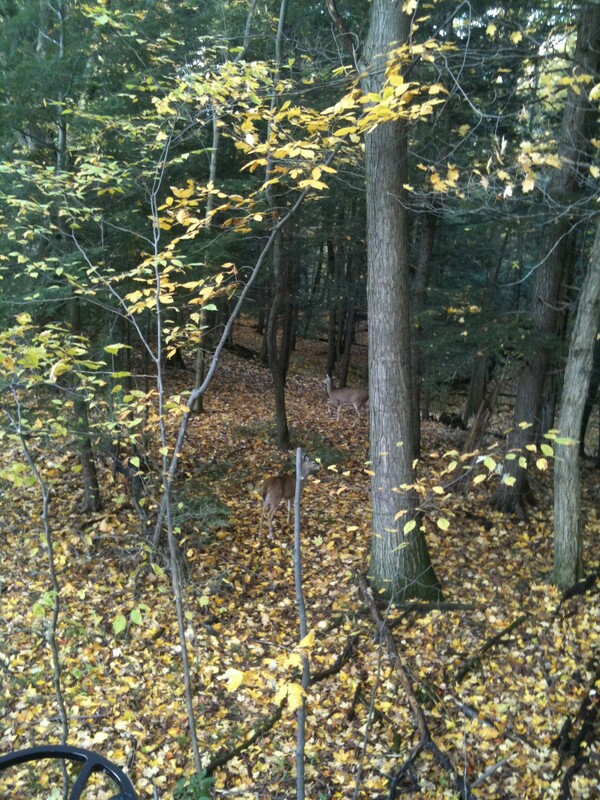 Be sure to check back weekly as I continue to chronicle my season and monitor deer movement here in the Northeast. This entry was posted on Monday, October 24th, 2011 at 9:38 pm	and tagged with archery season, Greg Johnston, Rut, Whitetail and posted in 2011, Day Afield, General Tales. You can follow any responses to this entry through the RSS 2.0 feed. Good stuff Greg! Can’t wait to see you chronicle taking down one of those giants that are rolling around the Finger Lakes area. Awesome Greg…I enjoyed the read!! Keep me posted on your your progress! That is what Kurt and I wanted to hear – the action is heating up! Hopefully we will have some good news from Allegany Co. by the end of the week. I’m thinking timing should be good for you! Best of luck whackin’ a big one!